Haute Cuisine or Grande Cuisine, the elite cuisine of 19th century Europe, was rigorously codified and communicated with the development of two written genres, cookbooks and culinary journals and magazines. By the middle of the 19th century, French Haute Cuisine had become identified with professional and culinary mastery throughout Europe, as well as in the United States. The success of this first "modern" style of cooking was dependent on two things: specialized tools and specialized labor. Militaristic in organization, and scientific in conduct, kitchens serving Haute Cuisine had clearly defined hierarchies of labor. Cooks specialized in various areas of the cuisine: pastry, sauces, roasting, cold service, hot service, or butchering. All of these functions required tools tailored to the needs of each specialist. Known as a batterie de cuisine, these kitchen utensils were mass-produced by specialty purveyors of kitchen equipment in prescribed shapes and sizes. Two areas of the Rietz Collection illustrate the level of specialized technology developed for the production of Haute Cuisine. The first group of objects is an array of copper saucepots, kettles and pans manufactured in the latter half of the 19th century. Although made in France, these professional kitchen tools were designed for the English market. The second group illustrating the new specialized food techonology is a large collection of ceramic, glass, and metal molds or forms for the molding of jellies, aspics, creams and ice cream. The first group of objects includes a collection of copper cookware consisting of about 35 individual objects. Most are flat-bottomed pots with long handles, indicating that they were intended for use on a large, flat-topped range, rather than over an open fire. However, some have convex bottoms with a narrow flange 2 to 3 inches from the bottom. These were for use in a range with direct exposure to the fire. The objects range in size with obvious graduation of volume. A set of six copper, long-handled sauté pans lined with tin range in size from half a quart to several quarts, their diameters expanding as they increase in size. 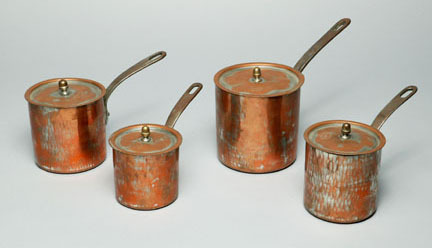 A similar set of five graduated pans with lids, used for keeping sauces warm, are also made of copper with tin lining. Inscribed on the outside of each saucepan is: "Made in Paris for E. Bennet, 55 Dean Street, London W."
The second group of objects discussed above is a vast collection of molds and forms. These objects were developed for in Europe during the late 18th century and used for elaborate cold buffets. Jellies and aspics, made from gelatin rendered from veal and pork, held a prominent position in the cuisines of the Western European gentry and middle classes from the 16th through the early 20th centuries. It is hard to imagine the prominence and attention that molded jellies and aspics held in European formal cuisine from the late Renaissance, when the technique was refined, to the 19th century, when the display of molded jellies on buffets took on an almost architectural grandeur. The Rietz Collection contains a vast sampling of the differing styles, sizes and material of molds and forms. Most are 19th century and of English and French manufacture. Shapes vary from geometric figures to almost life-like renderings of fruits, vegetables, and flowers. In addition to the jelly molds, there are also forms for molding butter, ice cream, almond milk, and custards. Because the fashion was so pervasive, these molds are quite common, with their mass production guaranteeing their ubiquity. to learn more about objects in the Rietz Collection of Food Technology. Search on Collection: "Rietz Collection of Food Technology"
and a category or object of interest. This exhibit was made possible by a generous grant from the Rietz Food Technology Foundation. © The Rietz Collection of Food Technology content by Joseph Evans, images by Dong Lin, 2005.